Vatican II’s Declaration on Religious Freedom marked a very important and dramatic crossing for the Church into the modern era, writes Bernard Teo CSsR. Dignitatis Humanae, The Declaration on Religious Freedom, was Vatican II’s final major document that Pope Paul VI signed and promulgated on December 7, 1965. Although a relatively short document, its content went through six contentious drafts and heated debates before its final passage. Its teachings marked a very important and dramatic crossing for the Church into the modern era – her official acceptance of church-state separation and the right of religious freedom. At the time of its drafting, there was intense secular and interfaith interest in its final outcome. Has the Church any new message to offer the world with its diverse religious faiths, political beliefs, and practices? Was the Church willing to enter into any kind of ecumenical dialogue in a spirit of mutual respect with them? Since Vatican I, the Church was a consistent and powerful opponent of the socio-political reforms of the Enlightenment that shaped many European governments. Among its key tenets were church-state separation, free speech and religious freedom. The establishment of governments under these principles saw the Church being driven out of the public realm, and many faithful suffered under these regimes. In response, the Church under Pius IX issued the Syllabus of Errors, condemning church-state separation, free speech and religious freedom because she believed that “error has no rights”. Underpinning this position was the conviction that Catholicism is the only true religion. This requires therefore, that whenever possible, it be established as the state religion with the state being governed by Catholic principles. In states where Catholics are in the minority, they have the right to public worship. In states where others faiths are in the minority, they have no right to public worship because only the true faith has the right to public worship. This belief that error has no rights created thorny complications for Catholics in public life, particularly in the United States. When John F. Kennedy was a serious presidential candidate in the early 1960s, his Catholicism became a potentially fatal liability for his presidential aspiration. There was strong unease about his true loyalty and identity. Could he be Catholic and a true American at the same time? Would he take instructions from the Pope and the Catholic hierarchy in the running of the country? This is because the American Constitution required a church-state separation, religious toleration and religious freedom. In a landmark speech in Houston to Protestant ministers, John F. Kennedy allayed these grave reservations by pledging that his responsibility as President was to uphold the American Constitution, and that he would not take instructions from the Pope in the governance of the country. That paved the way for his election as the first Catholic President of the United States. On another front, the ravages of World War II ushered in an unprecedented scale of co-operation between Catholics and non-Catholics in the social reconstruction of Europe in particular, and also in the US. The Catholic hierarchy was worried that this trend, while good and valuable, might compromise Catholicism as the only true religion, leading Catholics to indifferentism, that is, the belief that all religions are equal in truth, and that one religion is as good as another. Hence, the hierarchy held that Catholics who co-operate with people of other faiths in the work of social reconstruction and social justice must not compromise the conviction that theirs is the only true faith. It is against this background that Dignitatis Humanae was received as such a breath of fresh air and a radical departure from previous positions. The document boldly proclaimed that religious freedom is the right of every human person, and it is grounded on the dignity of the human person. Above all, it declared that “this doctrine of freedom is rooted in divine revelation, and for this reason, Christians are bound to respect it all the more conscientiously”. Freedom of this kind means that all men should be immune from coercion on the part of individuals, social groups and every human power so that, within due limits, nobody is forced to act against his convictions nor is anyone to be restrained from acting in accordance with his convictions in religious matters in private or in public, alone or in association with others (DH, 2). This extraordinary statement implies that truth must be sought in a manner consonant with, and respectful of, the human person, human dignity and human freedom. It implies that people must not be restrained from seeking the truth and living the truth in solidarity with others. The statement therefore rejects and condemns all forms of manipulation by the powers that be that hinder people from seeking and living the truth. It also implies that public authorities must protect and respect these rights through enshrining them in their state constitutions. It is significant that during his most recent trip to the Middle East, Benedict XVI reiterated the necessity of protecting religious freedom in his address to its leaders. For him, the issue is about genuine peace. He said there will be no peace in the Middle East until its nations enjoy religious freedom because peace requires mutual respect, dialogue, seeking mutual understanding and uniting around basic human values. In his view, many human rights are grounded on the fundamental right of religious freedom. Wherever religious freedom is violated, our humanity is impoverished by its violence. However, it is never the intention of Dignitatis Humanae to advocate religious freedom as an absolute right. Its claims must be made in the context of other legitimate claims. Thus for example, where the exercise of my religious freedom does harm to others and to the community, it is the right of the community to restrict that freedom. The revered Jesuit, John Courtney Murray, who was one of the architects of the document, came up with a possible solution to the conflict of rights and duties in the community. He advocated the position of “as much freedom as possible and only as much restriction as necessary”. In our current climate where religious freedom is under direct attack in many parts of the world by both secular and religious authorities – these include blasphemy laws and restriction of worship to other faiths in Muslim countries, the issues of public display of religious symbols, both personal and institutional, the mooting of laws to compel disclosures of confessional matters, forcing religious institutions to conduct gay or lesbian marriage ceremonies, requiring the insurance of contraceptive practices for religious institutions, the organised state relegation of religious beliefs and practices into the private sphere where they could be domesticated – the teachings contained in Dignitatis Humanae are even more relevant today and a direct challenge against these practices. Furthermore, this document is also a direct challenge to all oppressive governments who restrict religious freedom on grounds of public order. In hindsight, the deep conflicts within the Church in the process of drawing up the contents of Dignitatis Humanae turned out to be a great blessing, a gift of the Spirit not only to the Church, but to the world at large. It is truly a prophetic document. This article is the ninth in a series commemorating the fiftieth anniversary of the opening of the Second Vatican Council. 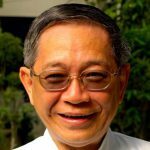 Bernard Teo, a Redemptorist priest from Singapore, has taught moral theology at Yarra Theological Union in Melbourne since 1991. Prior to his ordination in 1979, Bernard completed studies in philosophy and theology in India. From 1984 to 1989 he undertook doctoral studies in moral theology at the Catholic University of America in Washington. His teaching interests include fundamental moral theology, bioethics, human sexuality and human rights.